Jet-Ski - Static Pull | THERMO Spoken Here! Calculate the restraining force of the cable. 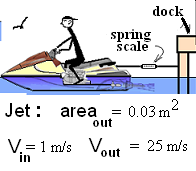 ♦ The sketch below right depicts the propulsion component of the jet-ski running full-power. To calculate the cable force requires momentum analysis. Care must be taken to keep forces and sums of pressure-forces clear. A scenario or "closer look" shows the propeller and ducting of the jet-ski. This sketch shows no forces; forces belong to a system sketch, the sketch of "isolated" mass. For analysis, we will take the system to be the single stream of water that is drawn into the intake (in) past the propellers (sometimes there are three) then "out" at high velocity through the exit plane of the jet. In essence, the water flows through a duct. Take the system to be the inside of that duct. (This system does not include the cable; we will deal with that after this analysis). The intake vane guides, the shaft and the propeller are not part of the system. Our system is water only! A sketch of our system in its non-operating condition is shown (right). 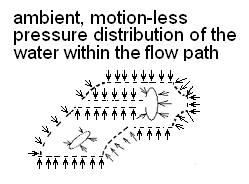 The system sketch shows water occupying the space but not flowing. The system is the water in that space. Forces at the system boundary are pressure-force types (atmospheric pressure enhanced by a small depth of water). Small increments of these forces are represented as "arrows" (pressure-forces) acting everywhere over incremental areas of the surface. Every pressure-force acts perpendicular to the surface (the direction being normal to the surface defined as an outward directed unit vector,n. Hence the directions of the pressure-forces are -n). The length of every "arrow" is intended to be the same. The non-operating pressure-force distribution sums to zero. Once operating, the flow of water through the duct causes local changes of the normal pressure shear (frictional drag which we ignore) over the outside of the entirety of our system boundary. To proceed, two steps are needed. Sketch the imaginary pressure-force distribution over system boundary while operating. Then subtract the non-operating distribution from the operating distribution. What is left represents the system reaction force (the force of the jet ski on the water). These steps were shown in the previous example, JET REACTION. This result of both steps is the sketch shown to the right. Mass equation: The mass equation is often obvious. We won't write it; mass entering equals that leaving. The pressure-force distribution has two parts. Its initial distribution summed to zero and is removed; the remaining pressure distribution (in operation) is represented as its integral over the system surface. The distribution of operating pressure-forces is not known. The force associated can only be approximated. To proceed, it is imagined as "summed," then graphically represented on the system sketch as the system "reaction," (magnitude and location unknown). In this case the sum of forces on the water by the blade. (3) What pushes what gets confusing. Remember: the system is the water. The vector diagram determines ΔV. Vector diagrams might seem unnecessary. They are greatly needed later; a little practice now is advised. Finally draw a simple free body sketch of the jet-ski. We know the jet ski floats; the sum of forces in the vertical equals zero. The cable resists the X - component of the force of the water on the jet ski. This case is simple, but properly approached, in preparation for greater complexity. Other thrust performance criteria for the jet-ski require momentum analysis of a moving system.